The Jamaican flag uses traditional African colors of black, green and yellow. The flag is said to use the motto “hardships there are but the land is green and the sun shineth.” The flag consists of black and green triangles separated by a yellow saltire or diagonal cross. The black triangles represent the adversity that Jamaica has overcome, while the green triangles signify the hope and agriculture of the country. The golden yellow saltire, diagonal cross, depicts the mineral wealth of Jamaica as well as the abundant sunlight. The Jamaican flag was adopted on August 6, 1962 after the island’s independence from the Federation of the West Indies. 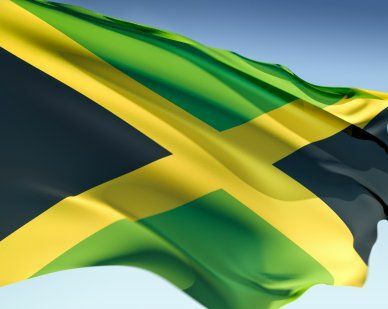 Our top-quality Jamaica flags conform to all official specifications. Emblems and designs are executed with the highest possible degree of accuracy in regard to detail, color shades, placement and proportion to flag size.